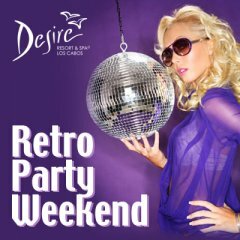 This time, Desire Resort & Spa Los Cabos invites you to come with your partner this weekend of our Retro Party. If you ever wondered what it would be like to relive the fantasy of the Studio 54, every second of our Retro Party Weekend will surround you with the most exhilarating atmosphere, setting the best mood for you to lose your inhibitions, just as it once happened inside the doors of the glamorous, NYC nightclub of the 70's. Feel like a celebrity and be immersed into a world of sensual bodies, incandescent lights and seductive music. Join us in our Melange Bar where Go-Go dancers will make your heart pound with their provocative moves and our DJ won't let you leave the dance floor, playing his upbeat disco music that will bring back to life the greatest hits of the 70's, 80's and early 90's. Wear all the classic accessories and attire of those decades with the shine and color only seen back then and be prepared for the nights that will blow your mind away! Thursday 16th - Pool party & Live DJ & Go-go dancers. Friday 17th - Hot Latin live band by the pool. Saturday 18th - Salsa classes & Hot couple contests.